With a committee set up by DCGI to analyse the feasibility of online pharmacies in the country, Pharmacists across the country have joined hands together to oppose the existence of such online ventures. With the growth of e-commerce, majority of goods being sold online, many big as well as small players have ventured in and setup portals trying to sell medicines online. From a legal standpoint, online sale of medicines is still in a grey area. At the moment, there is no law judging the sale of online medicines,and its doubtful that many of these online portals would meet the criteria that is in place for pharmacies in general to sell drugs, especially prescription drugs. Moreover, the mere existence of these online pharmacies may put in jeopardy the existing pharmaceutical ecosystem. Not only this, according the representatives of AIOCD (All India Organisation of Chemists and Druggists), the existence of these pharmacies raises issues on grounds of their legality and may even be harmful to the patients health in the long run. According to Pharmacy Act (An Act to regulate the profession of Pharmacy), “No person other than a registered pharmacist shall dispense any medicine on the prescription of a medical practitioner and whoever contravenes these provisions shall be punishable with imprisonment for a term which may extend to six months. To deal with this, DCGI decided to assess the feasibility and role of these online ventures and if possible to bring them under the legal ambit of the Pharmaceutical ACT. 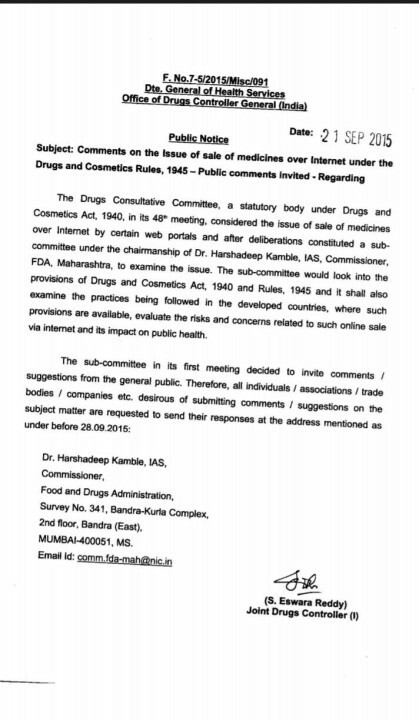 As a step, the subcommittee led by Maharashtra FDA Commissioner Dr Harshdeep Kamble has invited comments/suggestions from associations and general public on the above issue. Hordes of chemists through associations as well as in their individual capacity have written and are still writing to the committee opposing such online ventures. What the government decides will be known in due time. In the mean time, chemists all across the country are contemplate to gather together and unite to oppose the threat that may be coming their way.